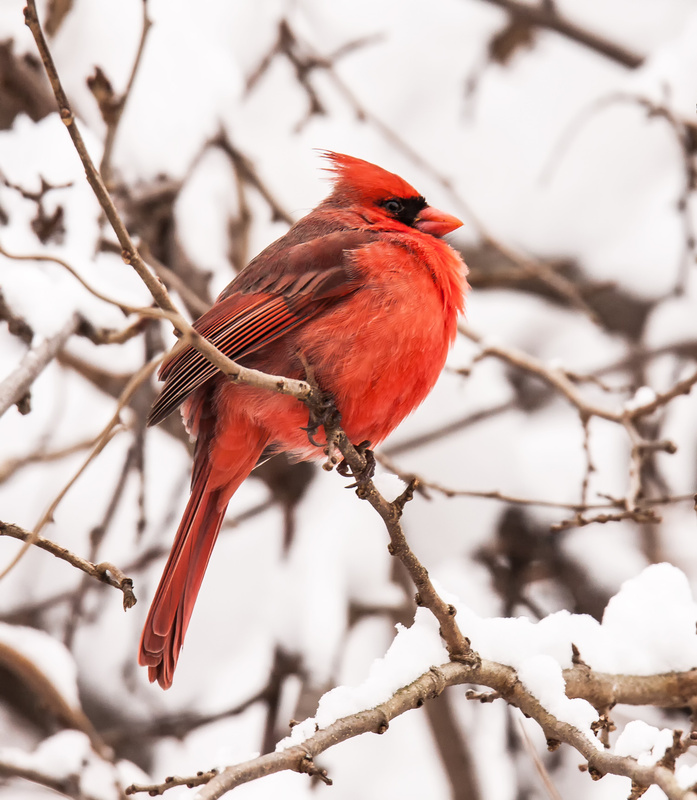 The cardinal in the snow is gorgeous, how could one possibly see too much of them? I posted a NZ dragonfly for you and Benjamin.. yawn, 6.24am here. Nature’s gifts! Great capture…thank you for sharing. I am very appreciative of the beauty of our amazing world and all it has to offer. The contracts are very visually pleasing! Benjamin likes the second photo best, but thinks the first one shows “the mostest snow”. I can not choose a favorite, both are so lovely. 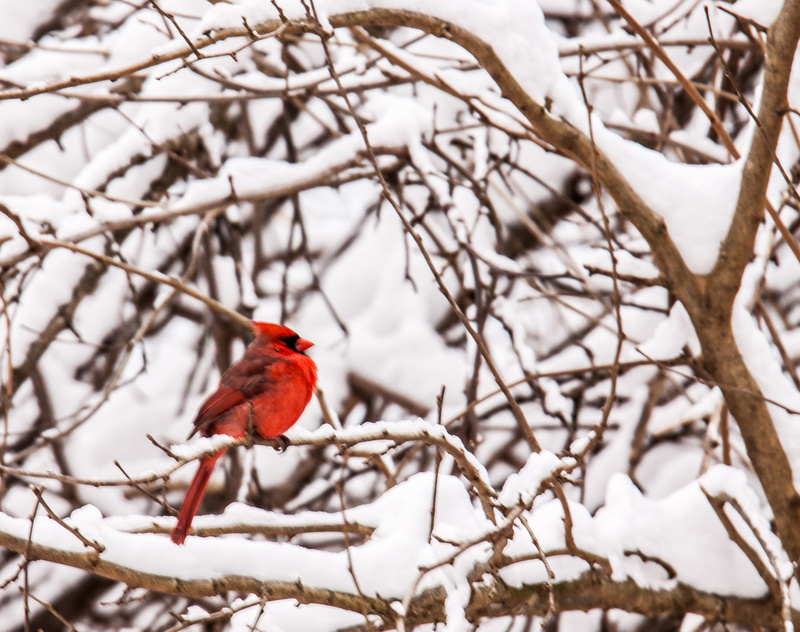 There is just something so beautiful in the contrast of the brilliant red of the Cardinal and the white snow. Benjamin said : “The poor bird is getting fluffy to stay warm. Gem, he needs those black seeds that we put in your feeders. Tell Mr. Mike to do that too!” He is impatiently waiting for snow, we haven’t had any this year as it has gone above & below us, but never over us yet. Enjoy it! Thank-you, Mr. Mike!! Thanks so much for the feedback. I am not surprised that Benjamin’s first instinct is to prefer the more detailed shot. I am thrilled that he noticed that the cardinal had fluffed up its feathers to stay warm. We had close to a foot of snow from this snowstorm, the biggest snow storm in a couple of years. We could easily have had more, given that it snowed for more than thirty hours continuously in nearby National Airport. I have some photos of a female and male Cardinal taken in a hackberry bush yesterday that I will be posting soon. They will look a lot warmer than your guy. Yes. This snowy scenery really shows the pucture. Love it. Beautiful images, Mike! A perfect Christmas card shot. on January 17, 2019 at 7:56 am | Reply Molly D.
Around here the snow with the stark grays and browns make them more lovely! We see them daily at our feeder. With the last storm they can in 5s and 6s. I agree with iconic, and these are great examples! If you have to have snow you might as well take advantage! Wow! The cardinal really stands out in snow!